I had an incredible day at the Salesforce NYC World Tour on December 14th, 2017 and think you would have too! 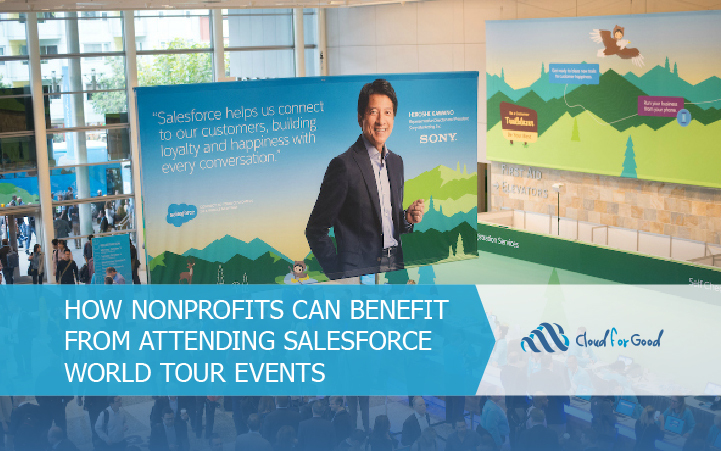 World Tour events are an incredible way to hear from other innovative organizations and learn how they are using Salesforce platforms to connect to their clients, donors, partners, and more. These tours also give your nonprofit a glimpse into the third-party applications and integration tools in the ecosystem and on the AppExchange. Some nonprofit and educational institutions may shy away from these events in fear they are exclusively designed to benefit for-profit companies, however, that is not the case. All nonprofits run businesses, generate revenue, have a need to collaborate, and track their vital constituents. World Tour events are great for organizations of all sizes and verticals. myTrailhead – Salesforce is extending the Trailhead platform to enable organizations to customize the learning environment with their own content and branding, from custom onboarding trails to company-specific enablement skills, making learning customizable, fun. You an learn more by visiting the myTrailhead site. Quip is a mobile-first collaboration tool to create, discuss, and organize your team’s work. Quip reduces emails and meeting time, by consolidating and reducing the number of communication channels. You can include calendars, Salesforce data, kanbans, polls, charts, and more. The tool becomes mission critical and can be a fun experience for your users. Survey Integrations are vital for organizations to assess progress, gain feedback, evaluate performance and perception over time. Let’s say you’re seeking client feedback on their experience attending a workforce development workshop over the last six weeks. Or perhaps you’re seeking feedback on the effectiveness of a volunteer or fundraising event. Turn feedback into action by integrating a survey tool like GetFeedback into your Salesforce instance. You can embed a survey within an email for a higher response rate and take action on that feedback from within Salesforce. You can use workflow rules to set a task for the relationship owner if the feedback score was below a certain threshold, automating processes while ensuring follow up. Salesforce integrations help your nonprofit work smarter, not harder. PerScholas has transformed their very high-volume annual application process into a streamlined online form which integrates directly into Salesforce. Their small development team, which pursues a large number of grants each year, is working smarter and faster with the NPSP grant management tool. Harvard University is transforming their campus-wide Salesforce success with a Center for Enablement team. This team is helping the various colleges with support, tool and feature selection, vetting third-party applications, standardizing the selection of implementation partners, and much more. In the “Public Sector Lodge,” presenters demonstrated how a social service, such as a drug and alcohol treatment program, could utilize Salesforce Einstein predictive intelligence to help counselors understand why certain categories of patients are more or less likely to stay sober. Predictive analytics can even help counselors predict whether a specific patient is likely to have successful outcomes. The Wildlife Conservation Society shared how they manage visitors, members and donors. New York University Steinhardt shared how they are establishing best practices for higher-ed operations. YAI shared their journey from migrating off Blackbaud products to a Salesforce environment and their continued growth (and success) with Salesforce. Meet your Salesforce.org team at their booth. Meeting with your Account Executives or asking a Solution Engineers specific questions about new features, is also a great benefit. In a very digital world, it’s always a win to meet face-to-face with someone that you often only communicate with via phone or email. Cloud for Good team members are usually in attendance at World Tour events. Reach out to us if you are planning to be in attendance at a Salesforce event in 2018. We are happy to help you get oriented and make the most out of your experience.